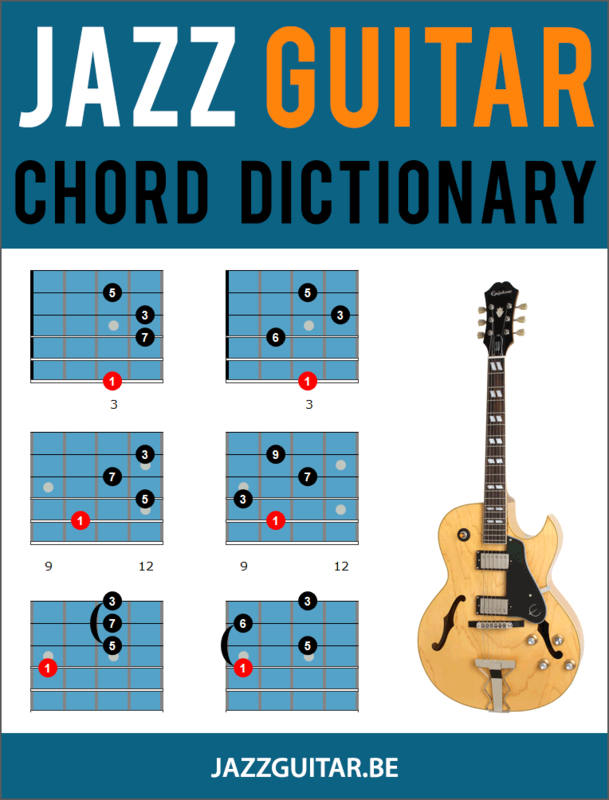 II V I chord progressions are the bread and butter of jazz, that’s why every jazz musician should be able to navigate these changes well. In this lesson you’ll learn 5 classic ii V I jazz guitar licks, in both major and minor keys, that you can use to bring a sense of jazz vocabulary into your lines and solos. The first lick that we’ll look at is a Pat Martino style phrase that uses the C dominant bebop scale over the first two bars (the Gm7 and C7 chords), before resolving to the Fmaj7 chord in bar three of the lick. The dominant bebop scale is a Mixolydian Scale with a descending chromatic note between the root and the b7. Sometimes we think about the dominant bebop scale as only being used over the V7 chord in a ii V I progression. But, since the iim7 and V7 chord are so closely related, you can often play one or the other over both chords (in this case, playing C7 over both Gm7 and C7). Over the V7alt chord, the line is built using the D altered bebop scale, where you take the 5th mode of the harmonic minor scale and add in the natural 7 passing note from the bebop scale. This is a cool-sounding and easy to play scale that you can explore further in your jazz guitar practice routine outside the context of this lick. In bar 3, the lick uses a G melodic minor scale over the Gm6 chord. When playing in minor keys, many players will often choose the melodic minor scale over the tonic chord to emphasize the tonic sound of the Im6, ImMaj7 or Im7 chord. Here is a short ii V I lick in the key of G major that uses some classic voice-leading ideas to connect each chord in the phrase. The first chord (Am7) leads from the b7 (G) to the 3rd (F#) of the next chord (D7). Moving from the b7 (of a iim7) to the 3rd (of the V7 chord) is a common and important way to voice-lead ii Vs. In this short minor-key ii V I lick in D minor, you find the same voice-leading technique from the previous example being used, only this time it is extended to the V7alt-Im6 relationship as well. To connect those two chords, the b9 (Bb) of A7alt is used to voice lead to the 5th (A) of Dm6. The last lick we’ll look at is a short chord-based ii V I in the key of F major that was written with Joe Pass in mind. Notice the altered scale sounds being produced over the C7 chord, that are then resolved into the Fmaj7 chord at the start of the second bar. This is a fun way to add a sense of tension and release to your chord-soloing lines over ii V I progressions. Hi and thanks. I learn something from all the lessons and enjoy them. I love the last lick with the chords. Simply nice to work with and experiment. 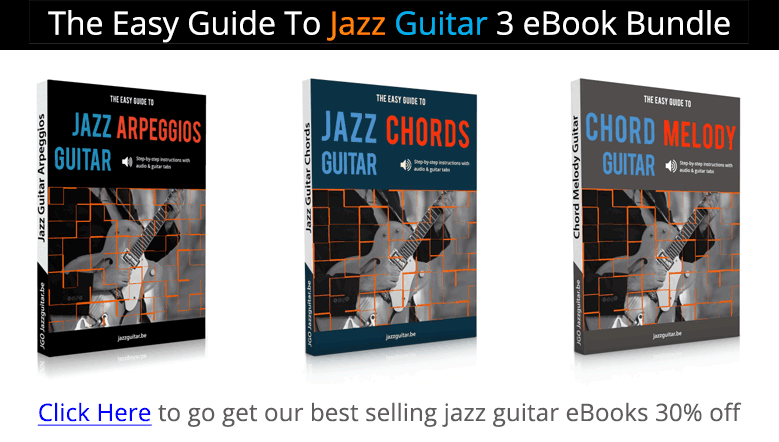 A very approachable lesson into jazz guitar. Beautiful and inspiring licks. Thanks for this Dirk! J’adore ces leçons, dommage que le livres ne soient pas édités en Français. Ek verstaan Mooi Man, maar is “zinnetjes” Nederlands vir “Licks” in Afrikaans sou dit sinnetjies wees. Maak nogal sin. Beautiful and creative licks, thank you ! Great Bop licks to add to the armoury. My eyes are begining to open to what seemed impossible. Thanks very much for helping me take my first baby steps even though the world says I am a man. Great introduction to the bebop scale which is still somewhat of a mystery to me.Thanks. A present I’m working my way through a work by Randy Vincent entitled, JAZZ GUITAR VOICINGS,Sher music company.–too advanced. Do you have suggestions which would help me develop this concept step by step? Nice licks, much appreciated BUT what would be GREAT is if you could play a bar or two of a standard, and fit one or two licks into it so that amateurs like us (or me, at least) could get a handle on how to start building an improvised solo into a melody…Any chance you could do this? I’ll be woodshedding with these with Summertime. It’s only been 30 years I’ve been messing with that song. I should get the two five one bit down someday. I have a dumb question . . . but it’s really important for me to understand so I will set my ego aside! You have notated these all as ii V I. But some of these are in minor keys. Shouldn’t those be ii V i? I really want to nail down how to handle these. Thanks for a great article and all the stuff you do. This lessons were the best by far. The generosity of sharing these and ease of learning blows my mind. Thank you all! This is the type of work I particularly my humble level. You may not believe it, your mini free courses are much more comprehensible than those paid lessons on the web. How would you explain harmonicaly the second chord of Gm7 in the fifth lick? It looks like a quartal harmony chord (m7/11 chord). Yeah, that’s just a 4th chord, so Gm11, common shape used by Joe Pass, Wes and others in this type of lick. Your site is nothing less than a goldmine….without the diggin`… just grab, rehearse,develope your own skil…and versions ….and use!! you’re completely right, Carl. very nice remark. very nice. it’s giving us a push in the right direction. like it!! just sight read them w/o my guitar, excellent, thanks! Great licks! Cool sounds! I love your lessons which are pitched at just the right level. Is there a way to loop the lick? It would be easier to learn if it just continued. Nice and inspiring licks. Thanks! I ALWAYS LIKE TO COMMENT WHEN I FIND SOMETHING VERY INTERESTING AND USEFUL BUT HAVING READ ALL THE ABOVE COMMENTS, I AM LOST FOR WORDS. THANK YOU FOR EVERYTHING FOR A LIFE-TIME LEARNING. Thank you for the sweet licks! I keep a running ‘library’ of my favourites… added them! Cheers! Hey, thanks. It can be slides or hammers/pull-offs. Try both and see what works best for you. Cheers. Technical problem with the website – please forward appropriately. I use the Safari browser on my iMac with a Magic Mouse and had no problems until recently (perhaps after upgrading to Mac OS High Sierra?). I now find that I can’t scroll up and down in the usual way by drawing my finger back and forward over the mouse. Your website is the only one I’ve encountered that behaves in this way, and I’ve found by experiment that I can scroll if I hold down the control key. There is no problem if I use the FireFox browser. I’ve tried Googling for a solution, but those posing this question have the same problem on all websites. New inspiration for my tired ii V I licks! Thanks. I do want to point out a slip-up in lick 2 that could confuse people who are trying to sort out all the scale choices over the V7. The text and the diagram accurately say/show that the line is built from the D altered bebop scale. However, that’s derived from the 7th mode of the Eb melodic minor scale, not the 5th mode of the harmonic minor as stated. The 5th mode of the HM in this case is called the D phrygian dominant scale. It can also be a bebop scale with the same natural 7 added. The scale contains the notes D, Eb, F#, G, A, Bb, C, C#. Thanks for checking out the lesson, yes I use the term “altered bebop” because it’s a bebop scale that fits over a 7alt chord. There’s no real name for that scale, so this describes how it’s used. Just fyi.